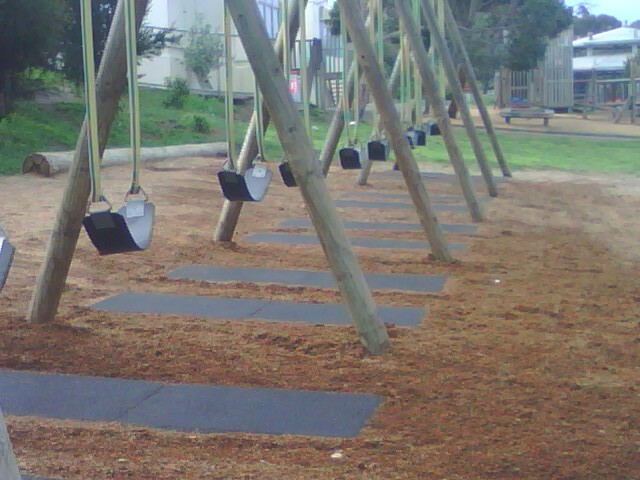 The Gecko Rubber Swing Mats are specially designed and manufactured to meet the Australian/New Zealand Standard: AS/NZS 4422:1996 for 1.9m Critical Fall Height for playground swings. The one piece units are easy to handle and install and the colourful speckled finish looks great all year round. The durable surface withstands daily abuse and requires no ongoing maintenance. Playground safety mats are ideal for underneath mult playground equipment, double swings and at the base of slides, where impact by children is most likely. Its unique rubber compound allows a cushion type impact to ensure maximum safety. Safety mats offer tremendous flexibility as they are modular pieces that can be laid to almost any size and come in a range of colours including: Terracotta, Grey, Botanic Green and Black with a speckled colour throughout. Being manufactured from recycled tyre rubber, the Rubber Swing Mat is a “Green” product and reduces the carbon foot-print. The installation of the playground mat is very simple. It can be laid on a concrete base or supplied with our optional prefabricated frame.